I never cooked with chicken sausages until I tweaked a recipe I found, and came up with this marvelous creation. Although you will need to spread out and use several pots and pans, it’s well worth it. Get our your large pot and begin cooking the pasta. As that is getting ready, pierce each of the sausages a couple of times with a fork then place in a large skillet pan. Add about 1-1/2 inches of water and pour in about 1 Tbsp. of oil. Bring this pan to a boil, then reduce it to a slight boil/simmer. Let the sausages cook until and the water boils away- this takes about 10+ minutes. Take the sausages out of pan and set aside to cool a bit; slice into coins – set aside. Then get out another skillet – a deep one – (I know there’s a lot of pans and a colander involved, but it’s worth the extra dishes) and add 2 Tbsp. oil. When that gets hot, add the peppers, onions, garlic and salt & pepper. Add your sliced sausages and cook this for about 10 minutes. Add the stock and stir in the can of tomatoes, bring to a low boil, then reduce to low heat. Keep simmering for another 10 minutes to meld the flavors. Back to the pasta – drain it and place back into the warm pot you cooked it in. Add the ricotta cheese and salt & pepper to your taste. Then add the parsley, basil and the 1 cup of grated cheese. 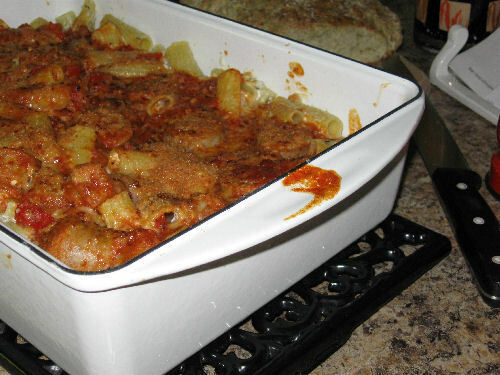 Last but not least, get out a large baking dish. Put half of the sausage & sauce mix on the bottom, top with all of the pasta and as gently as you can spread it around, then add the remaining sauce mixture. Sprinkle grated cheese on top, then place, uncovered, under the broiler for about 2-5 minutes. The cheese slightly browns and it sets the dish.